Lenovo India has launched a limited-edition variant of its Yoga 920 convertible laptop in the country. The Yoga 920 Vibes comes with a price tag of Rs. 1,27,150 excluding GST, which makes it a very expensive proposition, especially since it doesn’t feature a discrete GPU and offers only the Intel’s Ultra low-voltage CPU. 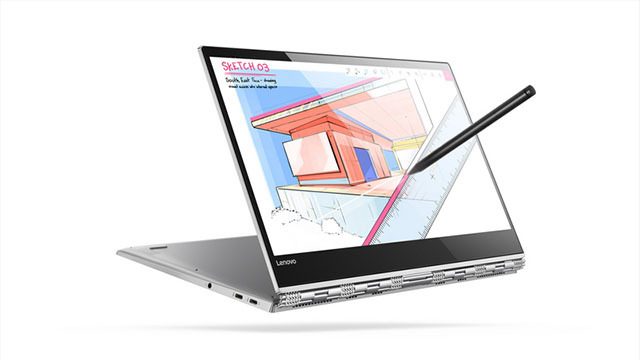 “The Yoga brand has been central to Lenovo’s leadership in the fastest growing PC category of convertibles. Yoga 920 is an ultra-premium convertible that packs the best of features in an unbelievable thin and light metal body. It captures the essence of Lenovo’s effort to give customer-centric products that are different, disruptive and innovative and solve real computing, entertainment and mobility issues, in style”. The 2-in-1 laptop comes with a copy of Windows 10 and the Lenovo Bluetooth Active Pen that offers 4,096 levels of pressure sensitivity. It features Lenovo’s ‘far-field’ technology to allow users to activate Cortana from up to four metres away, even in standby mode. The 4K UHD IPS touchscreen on the laptop has a 178-degree viewing angle and comes with what the company calls ‘razor-thin borders’. The laptop is the company’s first system to feature two Thunderbolt USB Type-C ports and it also features speakers from JBL with Dolby Atmos certification. As it is a Yoga model, one can flip the laptop around to use it in tent, tablet or stand mode, with ease. The Vibes edition also features Lenovo’s signature watch-band hinge which does bring a distinct look in comparison to the otherwise plain hinges in other 360-degree laptops. The complete package weighs in at just 1.37kg with a maximum thickness of 13.95mm, making it quite portable. The all-metal unibody design is finished in a platinum color for a premium look. It also features a fingerprint reader and support for Windows Hello authentication.